About time I typed a race report! It’s been twelve months since I finished an Ultra race (eighteen months pre-hernia). The Malvern Hills Ultra (2013) was the last, and it’s the one I returned to on May 3 to get some of that race mojo back in my blood. On resumption of training I realised a tough task ahead, and would need to come up with decent 4-week training block to get from a 4 mile jog to being able to run 52 miles (inc 8000ft elevation) over the Worcestershire Way and Malvern Hills. Over the next three weeks I increased the running mileage and managed 10 and 17 mile runs in consecutive weeks. Not huge distances but better than nothing. The week before the race was quite uncomfortable (health) but managed a couple of 5 mile runs with a heat-patched glut muscle. It felt great to start a race again. I didn’t know whether I would finish, so would enjoy the experience as much as possible, run a decent pace from the off see what happened. The Malvern Hills Ultra, now in it’s fifth year, is a 52 mile run along the Worcestershire Way and over the Malvern Hill range. It is an out and back course, 26 miles each way, so at the turn around at Malvern Hill Hotel, you get to retrace your steps and pass your fellow competitors. There are 5 checkpoints on the course, and four punch points to ensure everyone runs the correct course. My parents and girlfriend were at the event once again, and would park at both Checkpoint(CP)1 in Martley (7.5 miles into the race), and Knightwick (11.5miles) on both the outbound and return legs. The idea being if I had to bail-out from injury then I could walk back to the Talbot Inn at Knightwick and wait for their return, driving me back to the finish. Of course I was hoping this would not happen. After the initial pre race registration and race brief around 100 runners lined up outside Holt Castle. It was great to see familiar faces from previous years and the weather, although a little cold at first, was going to be perfect for the race. I felt quite good from the off and immediately took the pace up the front with a couple of runners chatting about 50m back for the first mile. The glut already started to get tight and sore even with an extra large Voltarol patch over it. As long as it was just stiffness and pain then fine. I enjoyed running the roads, paths, fields and wooded trails towards Martley, and even managed to keep to the pace from previous years by following the GPS tracker on my Garmin watch. I punched-in through the wooded sections and managed to navigate without issue. I somehow managed to check-in at Martley in a time 2mins quicker than the previous years, perhaps a little over-excited at my first race back. This year I’d managed to squeeze everything into a 750ml bottle waist pack, as well as making use of other pockets (including those around the new Salomon xlab shorts). I got caught out last year with dehydration, so I had to make sure I took a quick drink at the aid stations if I was to run with just 750ml between the checkpoints. I picked up food as I went, mainly munching on 9 bars with the odd handful of jelly beans and piece of malt loaf. The following miles from Martley were over rolling fields with a steep muddy climb to the top of Ankerdine Hill (a real knee screamer), followed by a steep descent of switchbacks through wild garlic to Knightwick. I took a breather with my parents and Yve before pressing on over the Teme river and towards my favourite section up on the wooded trail over the Chew and Suckley Hills, a precursor to the Malvern Hills. At Longley Green village (17 miles) I could feel the heat patch gravitating towards my bum crack, so I unceremoniously whipped it off outside a post office. I just hoped the body would hold up when I started to climb the Malvern Hills proper. At the New Inn I was greeted by the marshals (friendly and accommodating all day, as usual). It was now starting to get quite bright and warm, so I downed a can of red bull with some water before refilling the bottle, and moved on. The next twelve miles would be spent running back and forth over the Malvern Hills range, starting with a steep 400m climb up North Hill, and including a couple of steep stepped inclines. Normally I’d relish this challenge, but this year I was struggling. However, when comparing splits from both years it seems that whatever I lost in pace this year, I made up for in navigation. I fact I had this aspect of the race spot on. Not a minute wasted. Once I ‘d climbed up to the highest point at the Worcestershire Beacon I knew I was running well. Not as fast as last year, but I was sustaining the effort and had the engine to keep going for the rest of the day. At the Malvern Hills Hotel I met the organiser Steve Worrallo and my 9-bar sponsors Alan and Liz. Liz passed me a couple of ibuprofen which, along with the voltarol pill at CP2 did a good job of mellowing the pain in the glut and making the race bearable. It’s always tempting to take a longer rest here knowing you have to retrace your steps all the way along the Malvern Hills again. 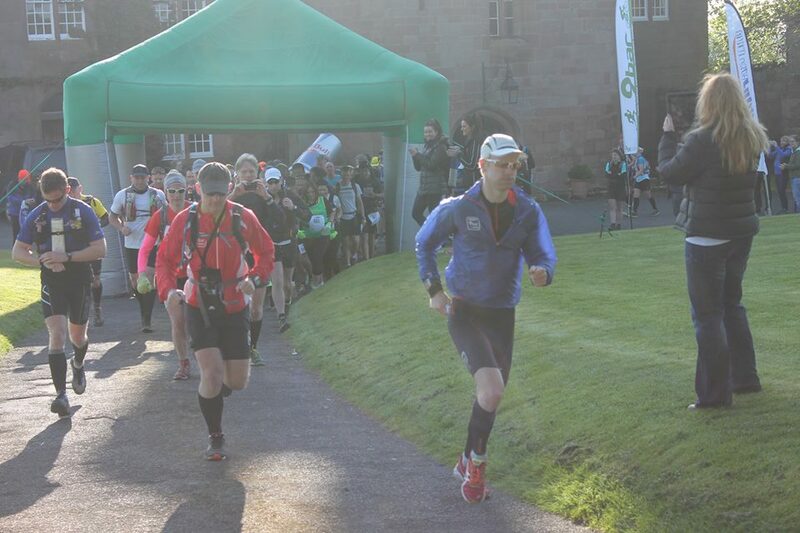 I was now joined by Rik Vercoe who was running the 26 mile event back to the castle. His race started at the time I left the CP. It was great to have his company to start with, but I knew I couldn’t stay with his fresh pace indefinitely and I had to let him go after a few miles. As I retraced my steps back along the 26 mile route I could see what my lead was (circa 35mins) and could exchange a few words with the other competitors. While running back over a field to the New Inn I passed a bunch of youths lounging around a tree looking like they were up to no good. One of them shouted “Hey mate, how far are you running?”. “52 miles” I said. His automatic response was a loud “Phwooooar! ?” which would have sounded more at home on an overlooking building site, rather than the middle of a field. As I approached the New Inn I saw Rik leave. Once again I probably didn’t take on board enough liquid at the aid station. I caught up with Rik at Longley Green where he tried to find the route out of the village. I stayed with him for a while before once again letting him take off, into the woods of Suckley Hill. It was nice to be under tree cover again and despite the mud was able to keep the miles ticking over nicely. As I ran off Chew Hill and down the road to Knightwick I could see Yve waiting on the bridge over the Teme. The Talbot Inn was heaving at this point, with people sat outside enjoying a pint in the sun. I envied them. I wasn’t looking forward to the climb back up Ankerdine Hill, but confident I still had enough of a lead I decided to walk most of it. Feeling light headed from the smell of the wild garlic, dehydration and the steep switchbacks, the climb up Ankerdine seemed to go on forever. When I finally reached the summit I took a breather and walked-off the aching muscles. I didn’t mind the rolling fields to follow as I knew that within half an hour I would arrive back at Martley, the last checkpoint before the finish and a chance to hydrate, big time. Just like last year I staggered into the checkpoint and dived straight into the liquid. I had about 500ml of cool coke which helped bring me around, but of course this didn’t sit well for the next few miles. I’d dropped several minutes over last year, which was expected. At this point I was just happy to complete the course. The following miles were a mix of light running and walking (uphill). I didn’t know what sort of a lead I had, and got a little paranoid checking over my shoulder on the longer roads. It was a pleasant surprise to not only finish the distance, but also get another win (fourth in a row now). I couldn’t have done it without the support of my parents once again. And it was great to finally get a result for my sponsors too; Alan and Liz of 9-Bar, Likeys and Eladon. I have been using all their products for the previous twelve months and they have certainly stood by me. I promised I would take a break after this event to allow further recovery. I’m glad I did it, if only to prove to myself that I still have the base endurance. I’m not sure when I will next compete. Of course I won’t be doing the Rennsteiglauf in Germany (17 May) and probably not the Enduroman 50 (31 May). 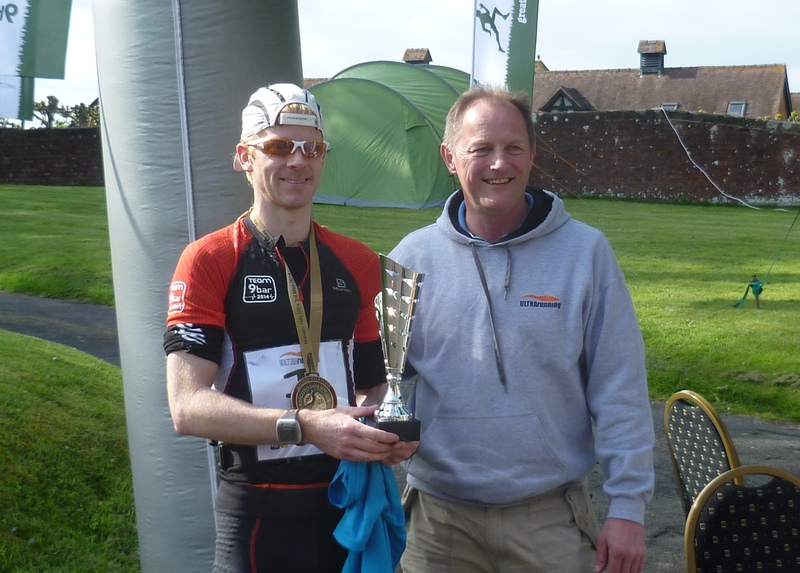 The next event may be the 12 Trials of Hercules in Shropshire (July) with a possible training camp in the Lakes in June.